This week has been absolutely crazy for me! Considering the weekend was one of the busier I've had in awhile I'm definitely feeling the effects (coffee was needed TWICE yesterday) this week. It definitely doesn't have any signs of letting up either since I have spinning tonight followed by undoing all the hard work we did at spinning by going to grab some delicious Mexican food. Oh well, what are you going to do right? So I figure what better way to get through the week than to link up with Katy from Vodka and Soda and share a few confessions with you. I confess that I really just wanted to take a break from blogging this week all together since I feel like life has been a bit "overwhelming" lately but instead I just took a break from fashion blogging. I originally thought being a "fashion blogger" (I use quotation marks because I don't really consider myself a fashion blogger per say. I blog about my fashion but I throw some other things in there) would be easy but it's actually pretty difficult getting all dressed up and getting those pictures taken. It sounds easy but life (and the weather) often get in the way. I confess that this ebola outbreak has me slightly freaked out. Not on the crazy "I'm never leaving my house" level but I'm definitely thankful to not be traveling right now just to avoid the possibility of getting stuck on an airplane with someone who is sick. I mean seriously, have you people seen Contagion? That movie scarred me for life. Watching that in the movie theater with friends was a horrible idea. I think I used almost an entire bottle of hand sanitizer during the movie and I immediately ran home to take a shower. Sorry guys, no hug from me tonight. I confess that when I see someone driving like a manic with a "baby on board" sticker I immediately judge them as being a bad parent. Doesn't matter whether your kid is in the car or not. If you have that sticker/sign/whatever it is on your car that means you want me to be respectful of you while you're driving but how the heck am I supposed to know when your kid is in the car if you never remove it? If you cut me off with that sticker on your car all bets are off. I confess that when I find a Taylor Swift gif I have to use it. Even if it doesn't necessarily fit in my post. Not my fault. We're besties she just doesn't know it and I just can't leave her out. Feel free to judge me. I confess that I had no idea you could no longer smile in your passport photo or have your hair in front of your ears until I went to get a new passport photo taken yesterday. I was completely unprepared for this photo and I hate it. Like full on cringe when I look at it. Last but not least I confess I have a serious addiction. If they had an AA group for this I'd probably be running it. I'm addicted to nail polish. I probably change my nail polish at least 2-3 times if not more a week. If I get even the slightest chip in my nail I MUST fix it immediately. I've already changed my nail polish twice this week. Three times if you count the one time I did my toes too. On that note, it's time for this day to hurry up and be finished. I've got a date with some queso and margaritas later! I'm with you on nail polish - i'm such a freak about it - so I'm really happy I'm not alone!! In that photo T-Swift is totally putting her head on you - besties for sure!! I'm a little scared about the Ebola thing too...on that note Happy Wednesday! ....I'm flying next week from DC to Sacramento and now I'm going to be freaked out the entire time. It's probably payback for the last time I flew with whatever sickness I had that almost exploded my sinuses when we landed and the poor lady beside me probably caught. I feel like the people who drive mini vans and have those "baby on board" thingys are seriously the worse drivers, Weaving in and out of traffic and sh*t. Baby on board my a$$! Or you are a horrible mom. Haha! Coffee really is a savior at times! I give you major props for all your amazing fashion posts, I can only imagine how stressful that can be sometimes. I love all your posts, fashion related or not! Um, I've never seen that pic of you a Taylor. Can I please be bff's with you girls too?! I'm jealous! The "baby on board" talk reminded me of an ecard I saw on Pinterest, something along the lines of "Baby on board, oh really? Ok. I was going to ram into the back of your car, but now I won't!" Cracks me up! My passport photo may as well be a mugshot since you can't smile, I look soooo mean! Where are you headed with your new passport? So exciting!!! I am cracking up - I love reading all these confessions! That is annoying about the passport picture - what is smiling and hair in front of ears really going to change?! I'm pretty sure they could still tell it is you in the picture. 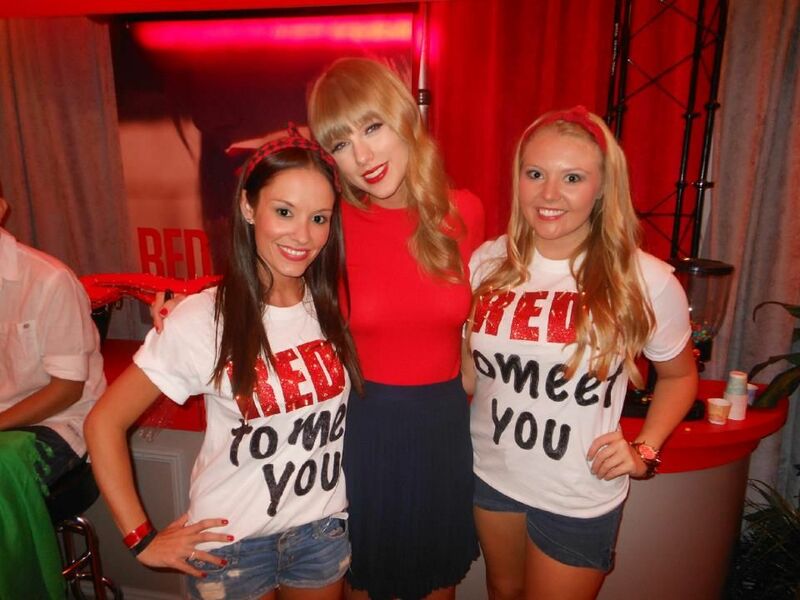 Also, you met T Swift?! How fun! Hope your life calms down a bit - I think we all are feeling a bit overwhelmed! Queso and margs!? Sign me up!! I'm wondering if the ears thing is new...I just got mine done this Spring and my hair is in front of my ears; I'm definitely not smiling though. I had researched before to make sure I took an appropriate pic! Love that pic of you and T!! Wait, you are not allowed to have hair in front of you years in your passport photo anymore? That is seriously annoying. I'm due for a new one next year I think, something to look forward to I guess... It's always interesting when people have those stickers on their cars and then drive like they completely lost it. Though that seems to be how most of the people around here like to drive. I'm always stunned when I leave the state and all of a sudden people stop to let you go ahead of them. And I love that photo of you and Taylor! your ears* I'm starting to get really sick of autocorrect. YOU MET TAYLOR SWIFT AND DIDNT TELL ME / BRING ME? No fair. no fair. I didn't know about your passport photos like that, but all of our ID photos are like that. No smiling, straight ahead, must see ears etc. To be honest, I always wondered why the US didn't have the same rules! Once my polish chips, it all must come off. Totally with you on that! And the whole Ebola thing scares the youknowwhat out of me. Not ok! Love your love of all gifts TSwift! Enjoy spin and Mexican!! OMG YOU MET TAYLOR GET OUT OF HERE. she is amazing. i am so jealous. i immediately scrolled to the bottom to comment this, now i must scroll back up & finish reading. Mexican is ALWAYS worth it! And plus, if you already have your work out scheduled beforehand, you are GOLDEN! Have a great Wednesday! I love changing my nail polish too. I hate chipped nails! You and Taylor make great besties :)! Blogging breaks are needed, take em when you want. i've been wearing polish on my nails pretty much all summer so i decided to give them a break. now every time i look down at my hands, they look so naked! Queso dip and chips is totally worth going over your calorie limit! hahaha that last gif!! Omg I was watching the news the other day and saw the ebola outbreak and had a mini freak out! It better stay over there! cringe! Haha you and Taylor are total besties! I am cracking up at these gifs! How fun that you met Taylor!! I think you and Taylor are BFFs! Do you see that head tilt?! So true about the crazy drivers with baby stickers! I wish I was the same with nail polish! I rarely polish my nails because they chip so often and the chipping drives me CRAZY!!!!! My toes are always done, but my nails are usually I painted to save my sanity! I just had to get a new passport pic too and it is AWFUL. How can you possibly look remotely good in pictures like that? I want to burn it. Chipped nail polish drives me crazy too! Did you see Taylor when she was here at the Amway for the Red tour? I was there too but very far from back stage lol. Um, how did I not hear about this Ebola thing?! I watched a documentary in 8th grade and have had nightmares ever since. I totally feel you on the fashion blogger photos! It took me like 3 weeks to find the time where everything lined up: having my husband available, looking (somewhat haha) presentable AND the weather cooperating for my one photo shoot! Tough stuff!!! Nail polish chips = life stops until a new coat is applied for sure ha. The ebola thing freaks me out even more because I had to read a book a long time ago for school about it and it's not impossible for it to spread super fast. Hope this is under control STAT. OMG my passport photo is heinous! Like maybe the worst picture I have EVER taken! I can't believe your best friends with Taylor! ;) Lol. How freakin' cool is that picture with her! I confess that I don't even know wth your takling about when you say ebola... ooops! Not sure how it is in other states, but in NJ we aren't allowed to smile in our drivers license picture either - mine is sooo awful! And I'm right there with you in the Nail Polish Addicts Anonymous group! I don't change mine quite as much (just because i'm lazy!) but at last count I owned well over 100 and don't see myself stopping anytime soon.. but I figure there are much worse vices out there, right?! Uh yeah that whole Ebola business?! NUH UH. I want to quarantine myself in my house. You don't mess around with that crap! Also, there were a bunch of people diagnosed with flesh-eating bacteria in Florida apparently?! WTF? The world is ending and I will be living in a bubble from now on haha.And you met T. Swift?! SO awesome!! OMG that last gif is perfection! Emma Stone is sooo good! You are totally a fashion blogger! ;) Great,I just found out I have to travel next week for work. I haven't even read about this Ebola crap, what the hell. I already don't want to go on an airplane and now i really dont want to! OMG I can't believe you met Taylor Swift!! I feel that if Taylor met me, she would want to be my best friend (along with Jennifer Lawrence and Emma Stone). Oh and I totally know how you feel about wanting to take a blogging break sometimes. I have been so overwhelmed with things lately. But I know I would be sad if I did take a break! OMG - the no smiling in your passport photo finally made it over to the USA?! Yay, now everyone can look just as ugly as they do in Aussie passports!!! When I had my passport photo taken a few years ago the guy was so rude to me and told me I couldn't smile because he needed to be able to see my eyes! I was like okaaay... I think being a fashion blogger sounds so hard-- not only putting outfits together but finding the time to take all of the pictures- I'm definitely impressed and always love your fashion posts! So cool that you met TSwift!! I think being a fashion blogger would be so much work, but you rock at it!! Always look forward to your outfits!